édité le 02/06/2017 - Plus de news de "SAIPEM" - Voir la fiche entreprise de "SAIPEM"
Saipem and Eni have signed a contract for offshore drilling activity in Mozambique, utilising the drillship Saipem 12000. The contract is of 15 months’ duration commencing mid-2019. It includes options up to a maximum of 45 months, not comprised in the contract value. In addition to this contract, which will allow the Company to participate in the development of the Coral field, Saipem has been awarded other offshore drilling contracts. The activities related to the other acquisitions will be executed in the Mediterranean and the Black Sea and will utilise cutting-edge vessels from the Company’s fleet. The total value of these new contracts is $230 million. Significantly, Eni has awarded Saipem a contract for the drilling of two wells offshore Cyprus. Work will once again be carried out by the Saipem 12000 and commence in the fourth quarter of 2017. The vessel will be subsequently deployed in Portugal for operations previously announced in 2016 and postponed at the request of the client. These awards attest to Saipem’s consolidation in the area of the Mediterranean where the drillship Saipem 10000 is already active. They also reinforce the Company’s presence in a market of particular interest where important discoveries have recently been made. Finally, the semi-submersible rig Scarabeo 9 will be utilised for the drilling of one well, plus an optional one, in the Black Sea. In service since 2011, the Scarabeo 9 is undergoing innovative upgrades, whose expenses are included in the contract. These upgrades will enable it to pass through the Bosphorus. This is a particularly important development in view of the interesting opportunities for offshore drilling in ultra-deep water in the Black Sea area. Saipem is one of the world leaders in drilling services, as well as in the engineering, procurement, construction and installation of pipelines and complex projects, onshore and offshore, in the oil & gas market. The company has distinctive competences in operations in harsh environments, remote areas and deepwater. 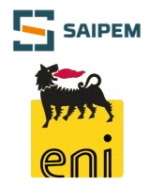 Saipem provides a full range of services with “EPC” and “EPCI” contracts (on a “turn-key” basis) and has distinctive capabilities and unique assets with a high technological content. Eni is an integrated energy company employing more than 34.000 people in 69 countries in the world. Eni engages in oil and natural gas exploration, field development and production, as well as in the supply, trading and shipping of natural gas, LNG, electricity and fuels. Through refineries and chemical plants, Eni processes crude oil and other oil-based feedstock to produce fuels, lubricants and chemical products that are supplied to wholesalers or through retail networks or distributors. Voir la fiche entreprise de "SAIPEM"
Les dernières news de "SAIPEM"
Toutes les news de "SAIPEM"